iOS 4.0 gold master candidate is available for download to the developers and the race to jailbreak iOS 4.0 GM build is already started. We have already reported that Redsn0w 0.9.5 can jailbreak iOS 4.0 on iPhone 3G however you need to be on official carrier since on updating to iOS 4.0 your baseband will also be updated to 05.13.04 for which no official unlock tool is available yet (unofficial tool Blacksn0w). The only way to unlock iOS 4.0 on iPhone 3G/3GS is to preserver baseband with the help of unofficial Pwnagetool 4.0 or the updated Pwnagetool bundles released by msft.guy for iOS 4.0 GM build. Though the process is not full proof and if you don’t know what you are doing then better wait for iPhone Dev Team’s official tools. Those brave souls, who want to still go ahead, here is step by step guide (Thanks to FSMdotCOM for guide) to Jailbreak iOS 4.0 on iPhone using Pwnagetool bundles. In brief the process is to make Pwnagetool 3.1.5 compatible with iOS 4.0, the two things which we are missing in Pwnagetool 3.1.5, one is iOS 4.0 GM firmware bundle and second is Cydia installer compatible with iOS 4.0. 2. Now right click Pwnagetool.app (Pwnagetool 3.1.5 for Mac OS X) and click on ‘Show Package Contents’. 5. 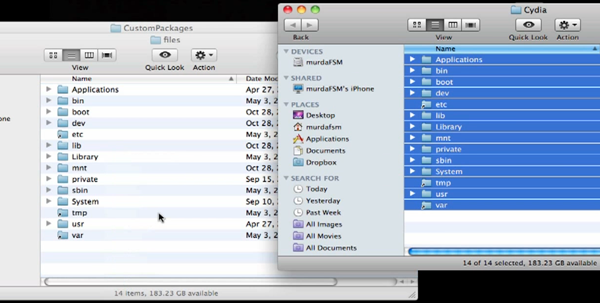 Right click on redsn0w.app and ‘Show Package Contents’ and browse to Contents>MacOS> . Copy Cydia.tar.gz on your desktop and extract its content. 6. Now you will need to copy Cydia into PwnageTool.app. To do that, right click on Pwnagetool.app and ‘Show Package Contents’. Browse to : Contents>Resources>CustomPackages> right click on ‘CydiaInstaller.bundle’ and ‘Show Package Contents’ > Files> and overwrite all the files with the ones you just extracted from redsn0w. That’s it, if you have followed above steps properly you will have jailbroken iPhone 3GS 4.0. Now you can run Blacksn0w to unlock iPhone 3GS 4.0.
what version of 3gs is this for? I am running the newer model week 45 3GS. Will this work? I attempted one from ensynched and this is for old boot. Hey The iphone says preparing iphone for restore and stays there for a long time. then just fails…. Any help pls? Do you need internet connection to restore using itunes? #8 – You must be jailbroken to jailbreak? Huh? i have the same problem. made the custom firmware, put my iphone in recovery(tried dfu as well), restore with 9.2 on mac. fails stuck at preparing iphone for restore and pops up with 16XX errors. i have iphone 3Gs with old bootrom jailbroken. The iphone says, “Preparing iPhone for restore…” with the progress bar moving for about 10 to 15 minutes then just fails. Error: “The iPhone “iPhone” could not be restored. An unknown error occurred (1604). I followed all the instructions to the T. Does any one know why? I think you also need to edit the file at PwnageTool.app/Contents/Resources/CustomPackages/CydiaInstaller.bundle/Info.plist to include iPhone2,1_4.0_8A293 in the supported list so that cydia shows up in PwnageTool as selectable package. Pingback: Guide to Jailbreak iOS 4.0 with PwnageTool - jailbreaj iphone 4.0, jailbreak iOS 4.0, jailbreak iOS4, jailbreak iPhone 3GS 4.0, jailbreak iphone 4, jailbreak iphone os 4.0, jailbreaking guide iphone os 4.0, pwnagetool - Technically Personal! Hi.. I’ve got 4.26.08 baseband currently so ultrasn0w will do the trick for me, am I right? Gets stuck on “Preparing iPhone for restore…” and then fails, followed everything exactly as stated, don’t waste your time with this rubbish tutorial. 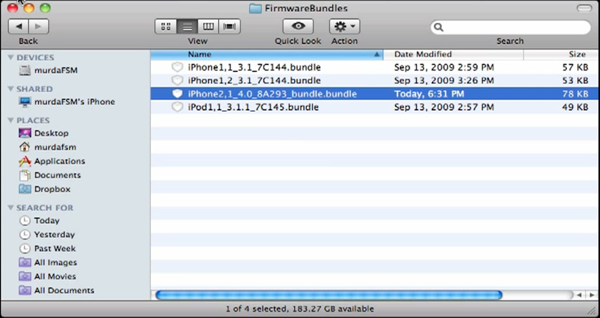 I have an iPhone 3G S that I have preserved the baseband on since 4.26.08 baseband. I have successfully installed the 4.0 GM Build jailbroken using the above guide. I tried to install Ultrasn0w and was unsuccessful. Currently the only baseband that is unlockable is 5.11.07. Geohot has allowed another Dev to make a rebuild of his blackra1n unlock for 5.11.07. I have searched everywhere for a way to update my baseband from 4.26.08 to 5.11.07 but have found nothing because Apple will not sign the restore of a fresh 3.1.2 which is the firmware that received the baseband update of 5.11.07 and since I have my UDID hash through Cydia, I can only install custom Pwnage made firmware which only further preserves my 4.26.08 baseband. Either that or I can just update my iPhone to the new 5.12.07 on 1.1.3 but that baseband is unlockable and Fuzzyband won’t downgrade my baseband because you have to have boot loader 05.08 for it to work and the 3G S do not come with such boot loader. It is only on some 3G iPhones. As you can see I have done my homework. Does anyone know how to unlock 3G S iOS4.0 GM running on 4.26.08 baseband? CONFIRMED FIX FOR 1604 ERROR!! I just tried the above method, but I cant select the 4.0 bundle in PwnageTool. I can only build a “iPhone1,2_3.1_2_7D11”. will this work for a 3GS on iOS 4.0.2? It is not jailbroken or unlocked, since I had to restore on iTunes to get it to do anything – arg! this is a solution for MAC – do you have one for PC (Windows 7 64-bit)?